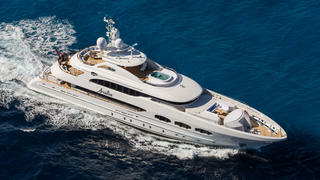 The 47 metre motor yacht Ariadna, listed for sale by Imperial in Monaco, has been sold with Andrew Bond at Fraser Yachts introducing the buyer. Built in steel and aluminium by Dutch yard Heesen Yachts to Lloyd's class, she was delivered in 2011 as the seventh hull of the yard’s 4700 series. An interior by Omega Architects features fine marbles and silk panelling with versatile accommodation in six cabins. A full-beam master suite is located on the bridge deck with another master suite on the main deck while below are three doubles and a twin, all with entertainment centres and en-suite bathroom facilities. The wide saloon has large settees to port and starboard, coffee tables and an entertainment centre including a home cinema system and a Kaleidescape server delivering on-demand video and audio throughout. Forward is a formal dining area with seating for 12 guests. Outdoor areas are extensive and include full al fresco entertainment and dining amenities on both aft decks, while the impressive sun deck offers a spectacular double waterfall Jacuzzi installation. Other features on offer include a range of water toys including two tenders, two SeaBobs, two Jet Skis and two jet surfers, all easily launched from the large beach club on the lower deck aft. Twin 2,320hp MTU diesel engines give her a range of 3,000 nautical miles at 12 knots. The price of Ariadna has not been disclosed.